Facebook said it detected “coordinated inauthentic behaviour in the region ahead of the upcoming elections in India” and removed these pages in four separate takedowns because of their desire to deceive users about their identity, not because of their content. In the first big crackdown on fake accounts for “inauthentic behaviour” in the run-up to the Lok Sabha polls, Facebook Monday announced that it has removed over 700 pages, groups and accounts from India. Those taken down include those associated with the Congress IT Cell and Silver Touch Technologies, a company that has worked for the government and the BJP. The social media giant also said that it had removed several pages in Pakistan that the company claims were linked to Inter-Services Public Relations (ISPR), the media wing of Pakistan’s armed forces. “We’re looking here for pages, groups that are designed to look independent, but are actually linked to an organisation or political party and trying to conceal or hide this link,” Nathaniel Gleicher, Head of Cybersecurity Policy, told The Indian Express over telephone. 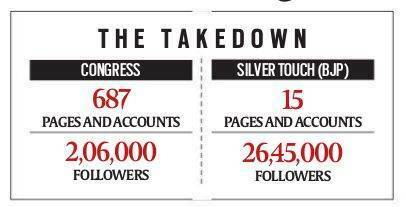 Among those removed were 15 groups, pages, and accounts linked to the IT firm Silver Touch Technologies including a page called The India Eye, which is popular with the BJP voter base. The India Eye had nearly 2.6 million followers, which is much larger compared to the pages linked to the others taken down. The group had 15,000 members, while the Instagram account had 30,000 followers. The group also spent around $70,000 (almost Rs 50 lakh) in ads. Content which were posted by pages linked to the Congress IT cell, according to Facebook. Silver Touch Technologies developed the NAMO app and is “empanelled with central government, various state governments and their supplementary programs for delivering IT solutions”, including the National Informatics Centre (NIC), Unique Identification Authority of India (UIDAI), Government of Uttar Pradesh, according to its website. Silver Touch Technologies could not be contacted for comment. Facebook’s Gleicher, told Reuters that Silver Touch Technologies was “associated with” a mobile app promoted by Modi’s ruling Bharatiya Janata Party (BJP). BJP’s IT head, Amit Malviya, however, told Reuters both the party and the app had “nothing to do with Silver Touch”. “We have told Facebook that this is a verified handle. This was really, really bizarre,” he said. 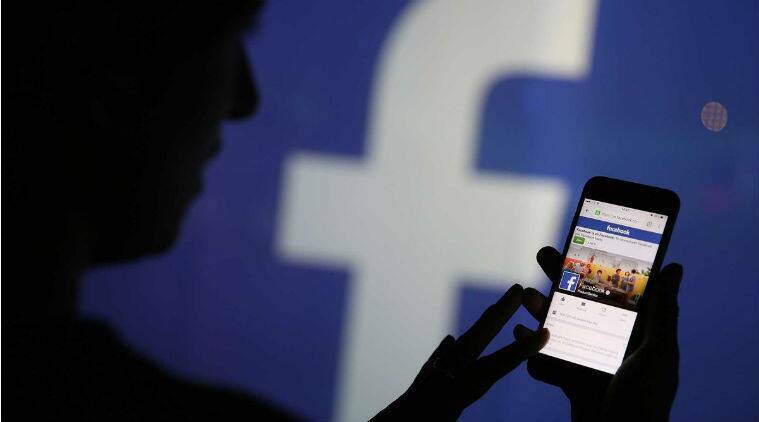 A BJP social media volunteer from Lucknow, Santosh Srivastava, said that Facebook took down 11 of his pages which accumulated to 2.5 crore likes, including “I am with Indian” with 4 million likes. 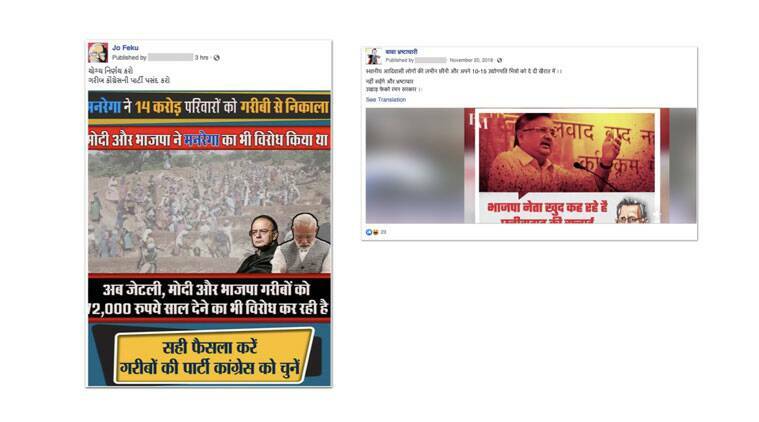 He said he has been devoting time and ad promotion money into these pages for almost six years and that they were not only BJP-supporting but also “pro-India” pages. 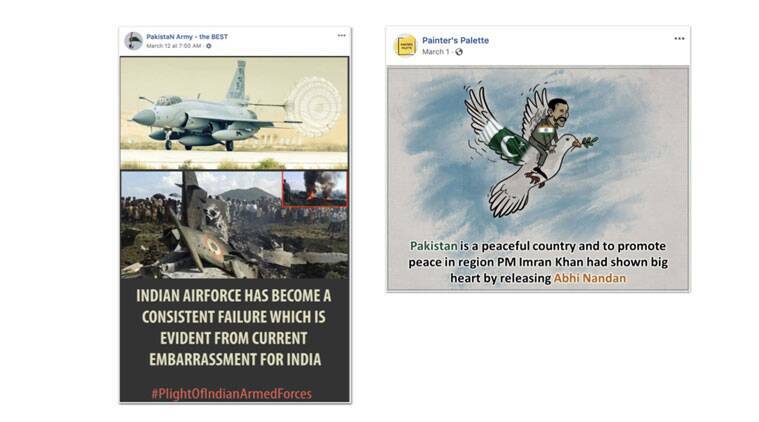 Some of the posts by the Pakistan-based pages, which praised the Pakistan Army and the current Prime Minister in their posts. A former Congress IT Cell Vice President Shilpi Singh Parihar, who left the position four months ago, said that her page, Rahul for PM, with around 3.5 lakh followers was taken down without warning. She joined as administrator of the page in 2017, and has four other party related pages, but does not take any money from the party. In total, Facebook says there were 138 pages and 549 Facebook accounts involved in this particular takedown and around 2,06,000 accounts followed one or more of these pages. Pages mentioned are Jo Feku, ‘Baba Bhrashtachari’ and content shared included asking voters to choose wisely and pick the Congress party in the elections. This network spent around $39,000 (Rs 27 lakh) for ads on Facebook, paid for in Indian rupees.